It gets your heart going without putting any impact on your body. Running is a great way to stay in shape, but one of the biggest drawbacks of it is that it can put stress on your feet, ankles, and knees. It will get your heart rate going, but it will come at a cost. With swimming, you won’t need to worry about that. 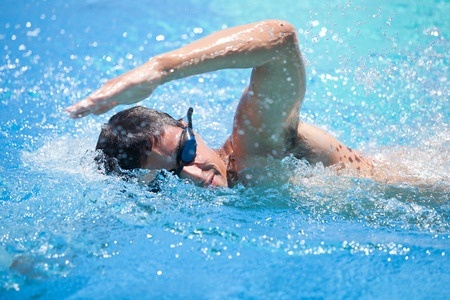 You can swim for an extended period of time without putting any stress on your joints at all. It’s why many people prefer swimming to other types of exercise. Are you trying to lose weight? Swimming can help you do it. Although you obviously won’t sweat much in the pool, you will burn a lot of calories while you swim, and burning calories is exactly what you need to do in order to shed pounds. By swimming on a regular basis, you will be able to maintain a healthy weight while also making your heart and lungs healthier. It forces almost all of the muscles in your body to work together. When you do certain exercises, like jogging or biking, you really only use a few muscle groups at a time. Therefore, you may need to do different kinds of exercise in the same day to get a total body workout. However, when you swim, you can work out just about every muscle group since you need to utilize them to keep yourself afloat and swim. From your arms to your legs to your core, you will feel the burn in every area of your body and give yourself a more complete workout overall. Do you wish you could swim more and enjoy all the benefits of doing it? Vista Pro Pools & Spas can make it a reality for you. We can help you design and build the perfect pool for your property and tell you more about the benefits of owning one. Call us at 301-805-0119 today to get started.